Flowmeters are used to measure the rate of flow of liquids or gases. They do not control the rate of flow unless they are equipped with a control valve or flow controller. There are two basic types of flowmeters; rotameters and electronic mass flowmeters. Mass flowmeters and mass flow controllers can be found on pages 60-62. Rotameters are a simple, precise and economical way to measure flow rates. They consist of a precision tapered glass tube containing one or more spherical floats. 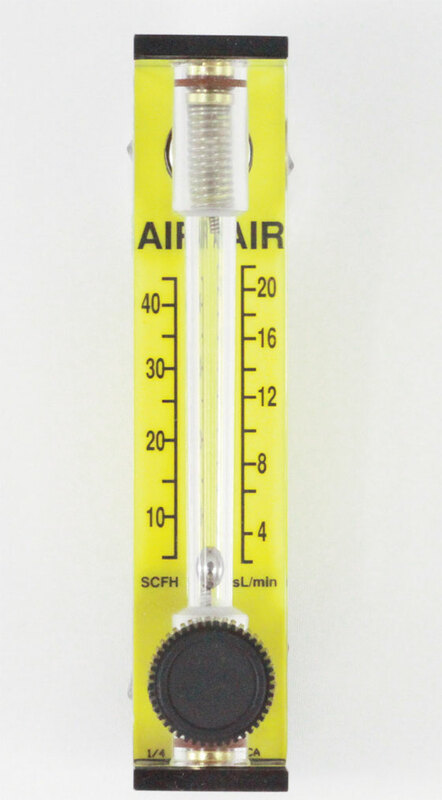 A measuring scale is etched on the glass tube. The diameter of the tube at the bottom, or inlet is approximately equal to the diameter of the float. As fluid enters the tube, the float rises to a point where the area between the float and the tube wall is large enough to permit unrestricted flow, and the float is stationary. This position corresponds to a point on the tube scale and thus permits a reading of the rate of flow. 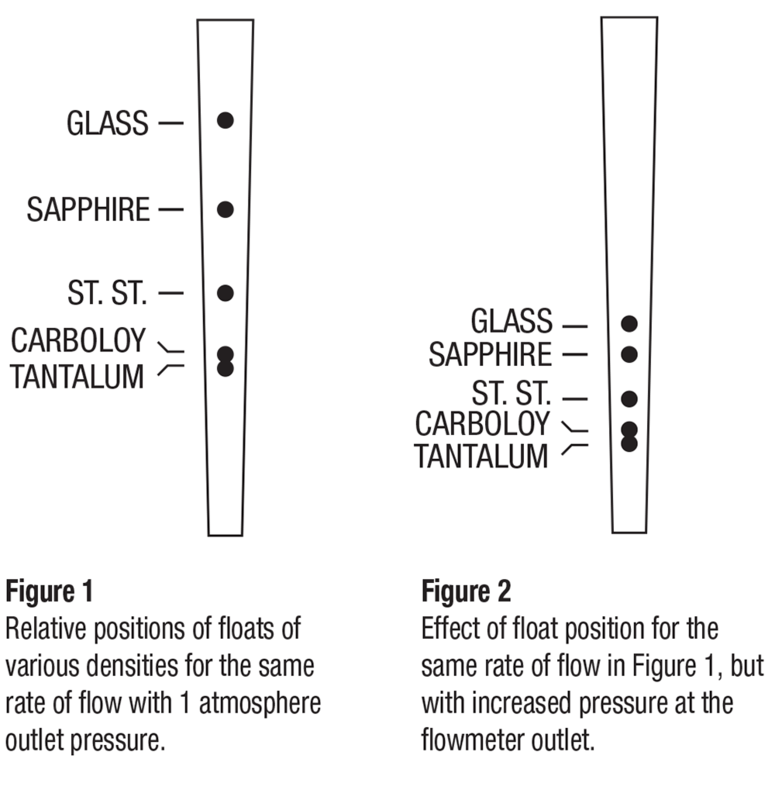 The capacity, or flow range of a tube can be varied by changing the float material. Materials of a lower density such as pyrex glass or sapphire give a lower flow capacity than materials of a higher density like tantalum or stainless steel (see Figure1). Rotameters, unlike mass flowmeters, are affected by temperature and pressure variation (see Figure 2). When equipped with a control valve on the inlet, readings are correct as long as the outlet pressure is equal to the pressure at which the tube was calibrated. When a valve is installed on the outlet, the tube calibration pressure must match the inlet pressure to the flowmeter unit.